Found c 1800 at Chateau of Perck, Vilvoorde, Belgium by Meuris, Head Gardener to Van Mons. Named after the German pomologist Diel. Medium sized, round to oval fruit. Slightly rough, dull yellowish green skin. Patches of russet. Sometimes a slight brownish flush. Creamy white, juicy, melting flesh. 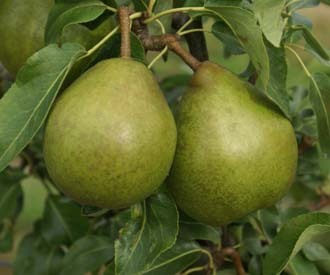 Excellent sweet flavour when ripe but needs a warm location and a good summer to ripen properly in Britain. Vigorous, spreading, hardy tree. Good cropping.